Tapping on a set will view the songs in the set. Songs will be displayed in the order you pick them, or can be arranged in the order in which they ought to be played. Tap on a song to jump to that song in the song viewer. Tap on the icon on the left to cycle through standard icons for songs to better organize your songs. Sets can also be navigated in the song viewer by swiping left or right, using foot pedals, or by tapping on the edges of the screen. If you don't have any songs, you'll need to add some first. Sets can contain more than just songs. Tap on the compose icon to the left of the + button to add a moment to the set. Sets do not contain any songs by default. 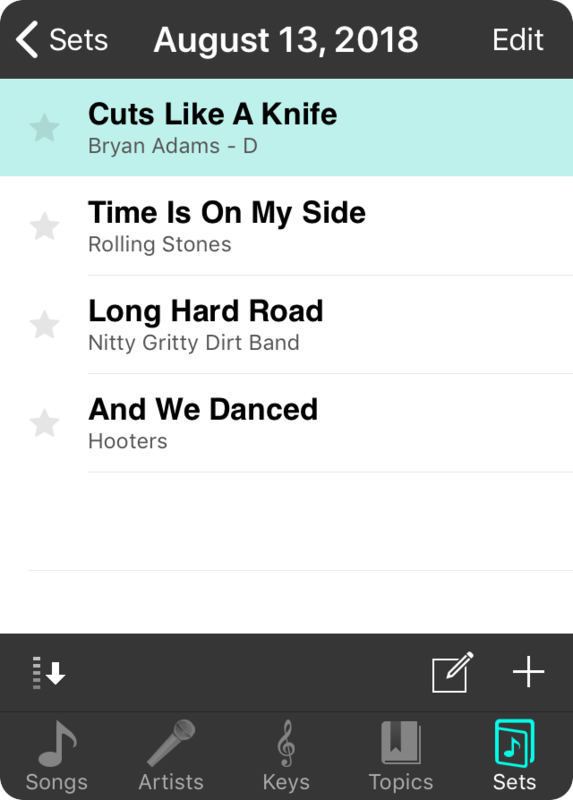 To add songs from your songs library for your set, tap on the + button in the lower right corner. Editing mode can be entered by tapping on the Edit button in the upper right corner of the screen. In this mode, you can delete songs, rearrange them for your performance, or tap on the name of the song in the set to open the Action Menu. This allows you to perform additional actions on songs in your set. Songs in your set can be sorted in a variety of ways. Tap on the sort button in the lower left corner to open a menu of sort options.